Throw away those oatmeal boxes and rubber bands! You don't even need a special work area. 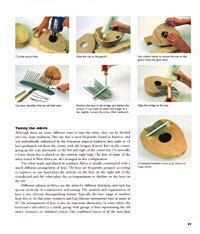 Using only your basic household tools and throwaways from your garage or garden shed, you can make any of the musical instruments in this books. 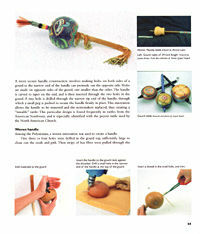 Gourds are natural resonators, already formed, waiting to be strung, blown or struck. 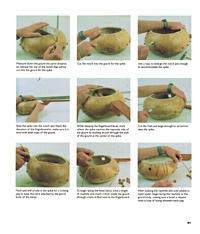 You don't have to do anything with a gourd but cut it open and clean it out. Presto! 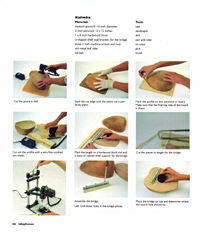 You have a banjo body, a drum frame, a bell for a wind instrument, or even a hollow tube for a flute. 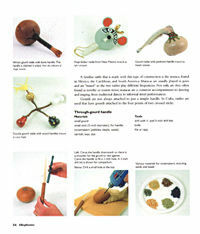 Some of the instruments you'll make with Making Gourd Musical Instruments: rattle, drum, rainstick, shekere, guiro, kalimba, xylophone, musical bow, lyre, guitar, spike fiddle, banjo, reed flute, clarinet and recorder. 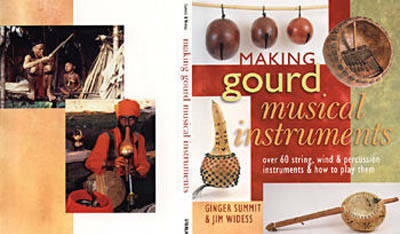 Making Gourd Musical Instruments is the book for anyone who has ever wanted to make a musical instrument. 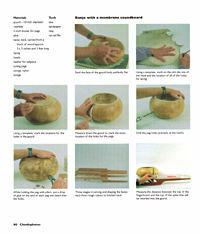 These ageless instruments are made using the simplest of tools and skills, yet still bring delight to musicians around the world today.